Real Housewives of Beverly Hills star Lisa Vanderpump is mourning the loss of one of her adored poochies, Daddio, who was the father of Giggy, her cherished teacup Pomeranian. Lisa took to social media over the weekend to inform her over one million Twitter followers of Daddio’s untimely demise. “My little Daddio passed away whilst we were traveling back, daddy of Giggy whom we adopted two years ago. So very sad,” said the 55-year-old avid animal lover. 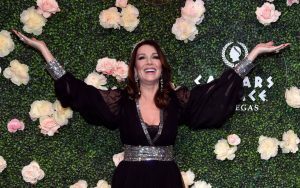 Photos: Lisa Vanderpump Hosts Luncheon At Pump – Which Co-Stars Attended? The ladies of The Real Housewives of Beverly Hills (and former OC cast member Gretchen Rossi) turned out to support co-star Lisa Vanderpump at a luncheon she hosted to benefit the American Humane Association and Vanderpump Pets. Among the attendees: Lisa’s hubby Ken Todd, who posed on the red carpet with Giggy and Giggy’s dad. Kyle Richards, Lisa Rinna and new cast member Erika Jayne skipped the red carpet arrivals, but Camille Grammer was on it, along with Lance Bass and husband Michael. Gretchen shared the photo above of the ladies behind the scenes. Weekend reality star sightings included Lilly Ghalichi, Lisa Vanderpump and many more! Above: Adrienne Maloof’s twin Brandi Glanville attends 2014 Kiis FM Jingle Ball Concert. Lisa Vanderpump ditched the pink wardrobe this weekend and opted for a blue dress for her Grand Marshal duties at the Palm Springs Festival of Lights parade. The Shahs of Sunset stars walked the red carpet at the Kiis FM Jingle Ball. It feels like the new season is never going to start! So much for #Shahctober, eh? Former “Girls Next Door” star Holly Madison hosted the 2014 Las Vegas Great Santa Run. Kourtney Kardashian and Scott Disick look far from broken up as they leave a lunch date hand in hand. LeAnn Rimes headed out in NYC with her umbrella holder and husband Eddie Cibrian after performing on the NBC Christmas Tree Lighting special. You’ll also find snaps below of Bethenny Frankel, Coco Austin and many others! Lisa Vanderpump and Giggy kept themselves busy yesterday afternoon at SUR. The Real Housewives of Beverly Hills stars co-hosted an American Humane Association cocktail party for their "Hero Dog Awards" at the restaurant. Lisa's hubby Ken Todd was in attendance, as was Tori Spelling's mom Candy, and even Real Housewives of Miami's Joanna Krupa. I'd give Joanna crap for trying to cozy up to Lisa in the hopes of landing a spot on RHOBH, but she's a big animal rights supporter, so I can't give her too much hell. She did share a smooch with a member of the Modern Family cast – see the gallery. Sadly, no Romain Zago sighting. What gives, Jo? In other SUR news, Lisa's restaurant made it on OpenTable's Diners' Choice Top 100 List – "2014 Hot Spot Restaurants in America". Congrats, Lisa! The Real Housewives of Beverly Hills cast kicked off their weekend with a trip to hell, otherwise known as the reunion taping! Brandi Glanville summed it up earlier this week when she said, "My hair is falling out, my skin is a mess. welcome to reunion week." The cast didn't share too much info yesterday during filming, but Andy and the crew did share a few snaps along the way. Above (now below) is Andy with the always fashionable Giggy. He captioned the pic, "Oh LORD we JUST wrapped #RHOBHReunion – it is a DOOZY. very emotional." Andy also shared about the day, "Still shooting #RHOBHReunion – all I can say is I would've made a damn good therapist."